Elizabeth Isabella Spence (1768-1832) isn’t among the better-known of the many writers on Scottish landscape and culture. 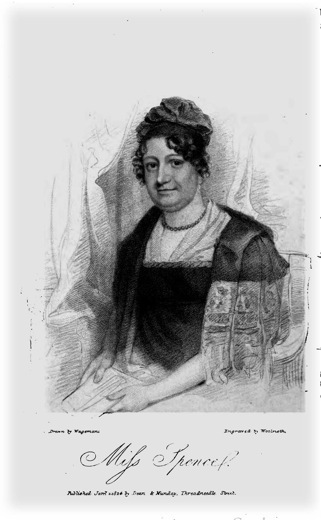 She built a modest reputation as a novelist in the first years of the nineteenth century; a brief article on her 1807 novel The Wedding-Day in the Critical Review, placed her “among the first writers” of sentimental fiction “of the present time” and noted approvingly that her romances were seasoned with the sort of morality that “might be expected from the niece of Dr. Fordyce”, the popular moralist whose Sermons for Young Ladies were more or less required reading for a generation of genteel young women.1 When Spence turned her attention from sentimental fiction to Scotland and to travel, however, she was overshadowed by tougher literary competition than that of her sternly sober-minded uncle. Scottish tours were something of a literary growth industry in the early nineteenth century, and Spence was competing for notice in a market dominated not just by the poems and (a little later) the novels of Sir Walter Scott but also by the work of number of moderately successful women travellers, including Sarah Murray, who, in 1799, published one of the first practical Scottish tourist handbooks, and Anne Grant, whose Letters from the Mountains offered readers a lyrical, idealized account of Highland life over the last quarter or the eighteenth century. As The Monthly Review noted wearily in 1813, “‘A Tour in Scotland’ is a tale so often told as to require, in any new book on the subject, the possession of something striking and unequal, in order to intitle it to a share of the public attention”,2 and the reviewer made clear that he was not convinced that Spence’s book did possess those qualities. (Given that he was reviewing the second edition of her 1811 , at least some readers obviously disagreed). To date, twenty-first century readers have seemed no less inclined to let Spence’s travel writing slip through the cracks of literary history. Yet Sketches and its 1817 follow-up, Letters from the North Highlands during the Summer 1816, offer an interesting counterpoint to the more familiar narratives of Highland sublimity and adventure. Although Spence is as ready as any of her contemporaries to rhapsodize about the sublime Scottish landscape, she also evokes a country and landscape that, especially in the later volume, seems at least as remarkable for its ability to nurture and inspire literary-minded women as it does for its now more familiar literary role as a site of wild, romantic adventure. In effect, then, in the decades around 1800, women travellers in Scotland, and particularly in the Highlands, had two main options open to them if they chose to recreate their experiences in writing: the more stereotypically “masculine” mode of adventurous encounters with the wild and the sublime, or demurely unassuming chronicles of strictly private experience. What is notable about Elizabeth Isabella Spence is that her work does not fit comfortably into either pattern. Admittedly, she claims affinities to the former in at least some contexts. In her introduction to Sketches, for example, she presents herself as a philosophical traveller, announcing that her intention is to provide her readers with an overview of “national manners and moral character”. Likewise, in Letters from the North Highlands, Spence explains that she hopes to contribute to the “correct transcription of national manners found in the other accounts of Scotland that were being published around that time. Yet in this case, she complicates matters slightly. Scott and the Waverley novels are, perhaps inevitably, among those “correct transcriptions” that she is trying to emulate, but she makes clear that she sees the novels of Christian Johnstone and Jane Porter as being no less important.9 Indeed, the book is dedicated to Porter and framed as letters to her. In presenting her observations in this way, Spence might simply be nodding towards the familiar mode of presenting women’s travels as private documents, even when they appear in print, but by tying her travels so closely to other female novelists’ work on Scotland, she is also placing her own representations of Scotland in what she represents as a network of intellectual and cultural exchanges on the subject among literary women. So even if, like every other writer of her generation, Spence quite happily acknowledges the powerful impact that Scott had on shaping responses to Scotland (in Sketches she includes an account of the transformative effect that The Lady of the Lake has had on tourism around Loch Katrine), the more interesting point about her “philosophical” version of Scotland is that it is profoundly shaped, on almost every level, by the work of other women writers. This is particularly the case in Letters, in which Spence structures her journey through Scotland, at least in part, around a series of real and imagined encounters with a wide array of literary women and their writing. Dunfermline is noteworthy as “the abode of genius, of no ordinary class”, as it is “the dwelling of the author of ‘Clan-Albin'”; when Spence visits Fort Augustus, she finds its “sublime and tranquil charms” all the more compelling because she has previously encountered them in the work of Anne Grant (303, 177). Her journey up the northeast coast reminds her of the fiction of Elizabeth Hamilton, and, as she approvingly notes the neat houses and gardens in the villages she travels through, Spence goes so far as to credit The Cottagers of Glenburnie with transforming the lives of the Angus peasants. When she reaches Aberdeen, Spence focuses less on the city itself than on a narrative of the life and work of the peasant poet Christian Milne (Spence remains the most important source of biographical information about Milne). Even in her account of the literati of Edinburgh, Spence brings a woman into the foreground: Eliza Fletcher, “the Mrs. Montague of Edinburgh”, whose house “is the centre of all that is literary, amiable, and distinguished” (37-38). Admittedly, Spence’s feminized version of Scottish culture was not one that her contemporaries were all that inclined to accept. The reviewer for The British Critic expressed mock surprise at learning from Spence that “so sensible and rational a lady” as Anne Grant “actually ‘knows no higher pleasure than to gaze on the clear bosom’ of a certain lake, and listen to a blackbird […] an occupation, it must be confessed, equally profitable and enlightened”.10 A few years earlier, The Critical Review concluded its own lightly mocking review of Sketches by suggesting, in “the fullness of friendship”, that Spence should “beware” a tendency towards “fine spun sentiments on feelings, family affections, and loving recollections, &c. &c., which swell the heart, fill the eyes, vibrate on the nerves, and all such like delightful female TREMBLATIONS”.11 The feminine context in which Spence places her own work is reduced here to the most conventional manifestations of literary sensibility. Most of her reviewers also pointed out, more or less gleefully, her verbal slips and her lapses in spelling. The unsubtle message of the reviews is that Spence is not a reliable guide to Scotland, although The Monthly condescendingly (and rather cruelly, given Spence’s clearly-stated aims in her preface) allowed that Sketches might “amuse” readers “who look for neither statistics nor philosophy at the hand of a lady”.12 Yet reliable or not, Spence deserves some attention for her travels, and perhaps even more in the twenty-first century than in the nineteenth. Tours in Scotland might seem hardly less “often told” for readers today than they were two hundred years ago, but Spence does offer us something new, or at least something that is often lost from sight, as she reminds us of the varied and significant contributions of women in shaping the early nineteenth-century narrative of Scottish landscape and culture. 1 Review of “The Wedding-Day”, The Critical Review, vol. 11, s. 3 (August 1807), pp.437-38. 2 Review of “Sketches of the Present Manners, Customs, and Scenery, of Scotland”, The Monthly Review, vol. 71 (July 1813), p.264. 3 See, in particular, Alastair J. Durie, Scotland for the Holidays: A History of Tourism in Scotland, 1780-1939 (East Linton: Tuckwell Press, 2003); Katherine Haldane Grenier, Tourism and Identity in Scotland, 1770-1914: Creating Caledonia (Aldershot: Ashgate, 2005); Zoë Kinsley, Women Writing the Home Tour, 1682-1812 (Aldershot: Ashgate, 2008); Betty Hagglund, Tourists and Travellers: Women’s Non-fictional Writing about Scotland, 1770-1830 (Bristol: Channel View Publications, 2010); and Katharine Glover, Elite Women and Polite Society in Eighteenth-Century Scotland (Woodbridge: Boydell and Brewer, 2011). 4 Grenier, Tourism and Identity, p.116, p.108. 5 For good discussions of Murray’s self-presentation as an adventurer, see Kinsley, p.116 and Hagglund, pp.64-65. 6 Anne Grant, Letters from the Mountains. 3 vols. (London: Longman, Hurst, Rees, and Orme, 1807) vol. 1, p.107. 7 Eliza Fletcher, A Tour through part of England and Scotland by Eliza Dawson in the Year 1786. (Edinburgh: National Library of Scotland ACC. 12017), p. 1. 8 Mary Ann Grant, Sketches of Life and Manners in England, Scotland, and Ireland: Interspersed with Moral Tales and Anecdotes. In Original Letters. 2 vols. (London: Cox, 1810). It seems fairly clear that Grant was trying to build on the success of her near-namesake Anne Grant, and she managed to secure enough literary patronage to be able to dedicate the book to the Princess of Wales. She also apparently had at least some network in Scotland, as her 230 subscribers include Elizabeth Rose of Kilravock and Elizabeth Grant of Rothiemurchus, but, unlike Anne Grant, there is almost no biographical information available on her, and she appears not to have published again after this book. 9 Spence, Sketches of the Present Manners, Customs, and Scenery of Scotland. 2 vols. (London: Longman, 1811), p.1: iv; Letters from the North Highlands of Scotland in the Summer of 1816 (London: Longman, 1817), p. viii. 10 “Miss Spence’s Letters from the Highlands”, in The British Critic, vol. VII, n.s. (May, 1817), p.470. 11 “Spence�s Sketchs of the Manners &c. of Scotland”, in The Critical Review, vol. XXIII, s. 3 (Aug. 1811), pp.384-85.